Jürgen Klopp has revealed Dejan Lovren is available to start Liverpool's meeting with West Ham United in the FA Cup fourth round on Saturday after coming through a return to full training unscathed. The defender was included in the squad for Tuesday's Capital One Cup semi-final second-leg win over Stoke City on penalties, having overcome a hamstring injury sustained in the first leg on January 5. And, though he did not emerge from the bench on that occasion, Lovren is now fully fit and capable of featuring in the starting XI this weekend, according to Klopp. The German also provided an update on the fitness of Nathaniel Clyne, Philippe Coutinho, Martin Skrtel and Jordan Henderson at his press conference to preview the clash with the Hammers, as well as expressing delight over the availability of Steven Caulker. "Dejan, it's good news. Dejan was on the bench against Stoke and is now back," the boss told reporters at Melwood. 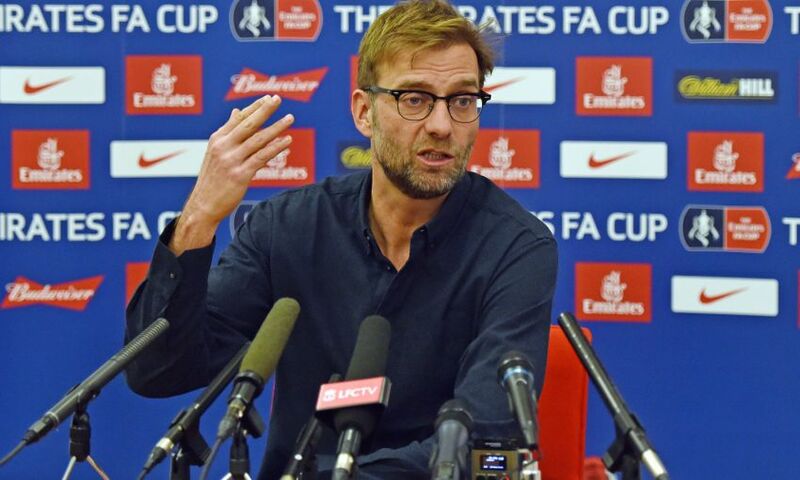 "Steve Caulker is not injured but he couldn't play the last game and now he's available for the FA Cup. He's like a new player. "[Coutinho] is close to returning to training but he's not in the team training [yet]. He [will finish] his last two-three sessions with rehab and then he will be back on the pitch with us. "[Skrtel?] no. Nathaniel, possibly, but we are not sure. He is much better, it was knee against knee and that's really painful. There's no doubt about the [durability] of Clyney. I asked him, 'One is no pain, ten is big, big pain - where are we?' and he said seven! "Maybe you should have a rest, then. But now it's three, two, one, hopefully zero and we will see. He will train today and we will know more about this. "Hendo can't be an option. He did really well for the team in a difficult time with a long-term injury, still having problems, only pain but it's always pain. "We now are on a really good way but we need to use these two days and hopefully he has recovered after an intensive time and is back in the race." Daniel Sturridge remains sidelined for the game against Slaven Bilic's side as he continues to battle the niggles that have left him unable to train consistently of late. But Klopp insists the staff at Melwood are doing all they can to find the source of the striker's woes and get him on the pitch to evidence his well-documented quality. "No news. There's not really something to tell you, to be honest," he continued. "He's still working; sometimes it's better and sometimes it's a bit worse because of one or the other issues. He did a lot of sessions in the last few weeks but it's always interrupted through a few breaks. He needs consistency in sessions and that's what we try to do. "That's normal [when you have] injury history. It's not coincidence, some things are not right if you are injured that often. We have to be really sensitive with all the information we get and that's what we try to do. "We [try to] find a point from which we can really train and build up fitness. He could do a lot of sessions in the last few weeks but, how I said, always interrupted through a few different issues where we always have to wait for what will happen. That's how it is. "There's no doubt that he's a very, very good player, how everybody knows. But in this moment - and that's how I understand it - he is not available so we don't have to talk too much about him because he is not here. "He cannot play tomorrow and for sure not against Leicester and I don't know what happens after this to be honest."